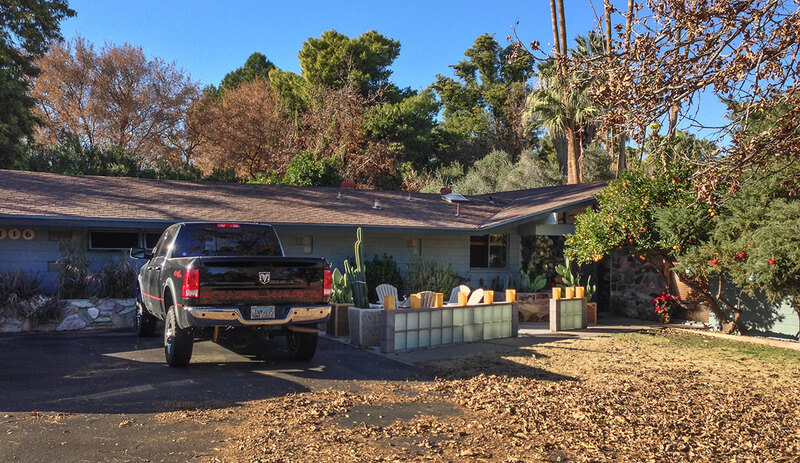 Our family’s Dean Coffman home is in the heart of Arcadia, just half a mile south of the Arcadia Falls. Our neighborhood includes a large estate listed on the National Register of Historic Places and many citrus, pecan, fig, apple and mulberry trees that thrive on the same irrigation system that was built in the 1920’s. We're the second owners of this 1956 house that we've called home for 30 years. In those 30 years we have had horses, chickens, many dogs and two wonderful children. At one point our daughter ran a roadside citrus and craft stand out front. This is a home, not just a house; as I know the family that built it, we know it was a treasured place. 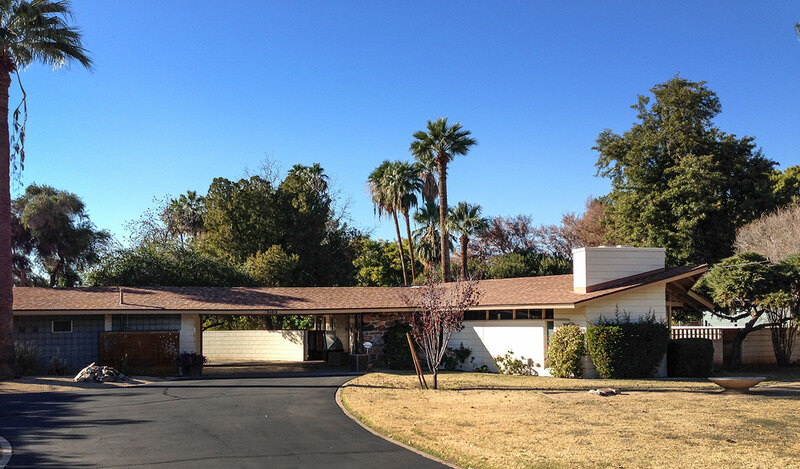 During the 1950’s Phoenix, Arizona was growing, aided by the increasing port-war mobility of the American population, the advent of air conditioning, and the perceived health advantages of living in the desert Southwest. Subdivisions of ranch homes were sprouting up throughout the area to attract east coast Baby Boomers drawn to a new life in the West. “Most people who come to Arizona to live become so completely sold on the state that their effervescent enthusiasm entices friends and relatives to follow,” claimed the September 1954 issue of Arizona Highways article Dream Homes by the Dozen. These homes were usually three bedrooms, one bath models created by home builders such as Del Webb, Alfred Anderson and Hoffman. There were few exceptions to this mass produced form of post WWII home craft. One individual who stood out in the crowd was Dean William Coffman, who began his career during his junior year at Phoenix Union High School in 1946. Before he graduated he worked for Harry Herrsher, Mel Ensign and later Ralph Haver, and his early promise led to his being recommended to attend the architecture school at Arizona State University. Dean was then offered an apprenticeship with Frank Lloyd Wright, which he turned down in deference to the growth of his little family. 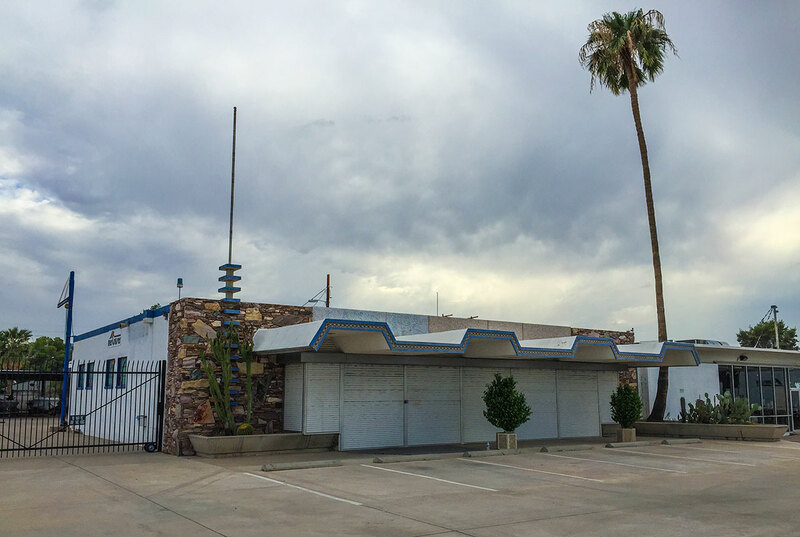 He did not want to have his wife and two little boys raised in the desert of Taliesin West. He started his own building and design business instead. Our home, as designed by Dean Coffman, was built in 1956 with the assistance of Italian craftsmen who would become the first owners. In 1952, William and Lucia Bartolotti purchased a large lot on North 52nd Street that would accommodate three homes, to create a family enclave for his two daughters and their families plus a home for William and Lucia. It was within walking distance of the newly constructed Saint Theresa’s Church and would also be close to the family’s marine business on Thomas Road. This close knit Italian family from Detroit were skilled stone masons. While building homes the Bartolottis had the good fortune to join by marriage with the Robertsons, skilled craftsmen in the glass block business. Mr. Bartolotti also joined forces with Bart Del Duca, owner at that time of Marvel Stone. 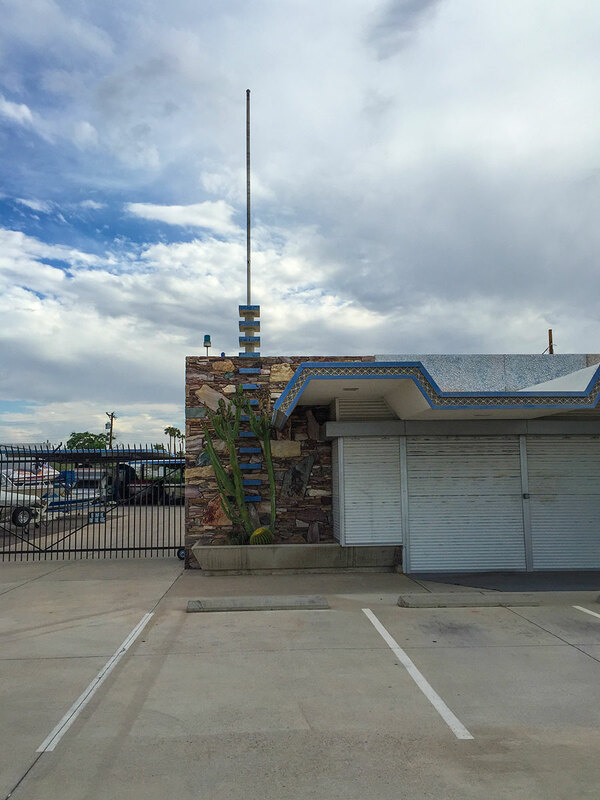 Both of these businesses are actually still successful; when we wanted a new outdoor patio we hired Brian Robertson for the job, which he was able to complete with some of the original glass block from our house. I met Dean Coffman and his wife one day several years ago when I noticed a car parked in the driveway of our house. I walked out to see what the people in the car wanted. The man at the wheel said ”I don’t know if you know the architect of this house.” Recognizing the architect, I replied, “Dean Coffman, get out of this car and come into your house!” He told me wanted to see the house that he felt was his favorite. When I started to archive this home I looked everywhere to find out information on Dean. No one seemed to know about him but finally I found his son Dennis Coffman. Dennis gave me information about his father, who was a quiet man who listened to his clients’ ideas. He often found clients who were craftsmen in their own right. 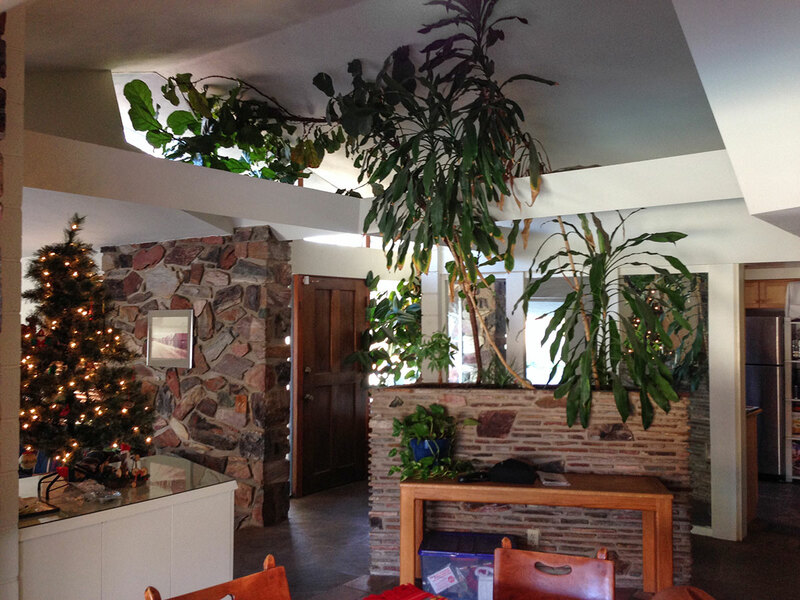 Dennis located many original designs for homes that were in his father’s archives. I have been able to track down some of the “fingerprints” of Dean Coffman’s style thanks to connecting with Dean’s son Dennis. Contact Modern Pheonix if you think you've found another Coffman! 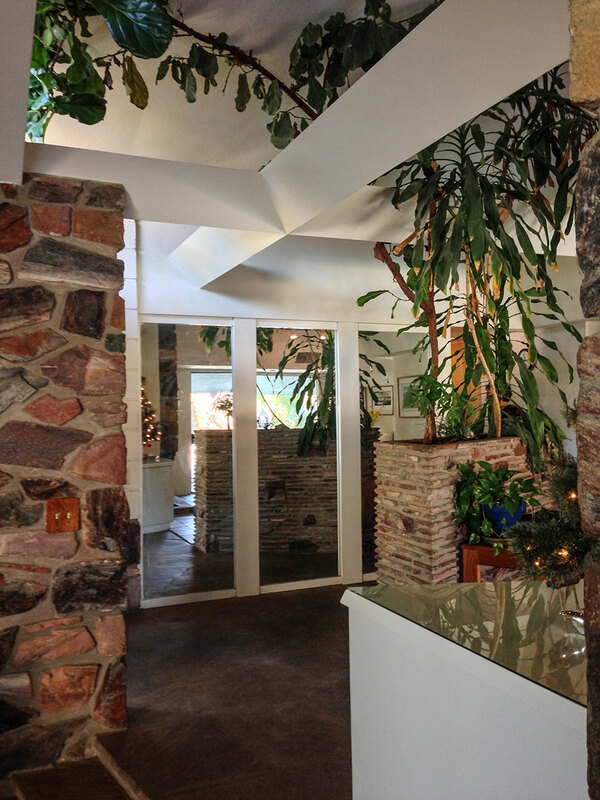 Clerestory windows in the entry of the home. Cabinets created by Dean’s father to define the living room and dining room. Use of glass brick in all areas of the home.